In 2013, archaeologists discovered 24 decapitated and mutilated bodies at the ancient Mayan city of Uxil. The burying of the victims was quite elaborate: They had been stored in an artificial cave that served as a water reservoir, were covered by a layer of gravel, and then were sealed shut in the caves by a layer of clay. The bodies were discovered after an examination of Uxil’s drainage system; they had been forgotten entirely before then. 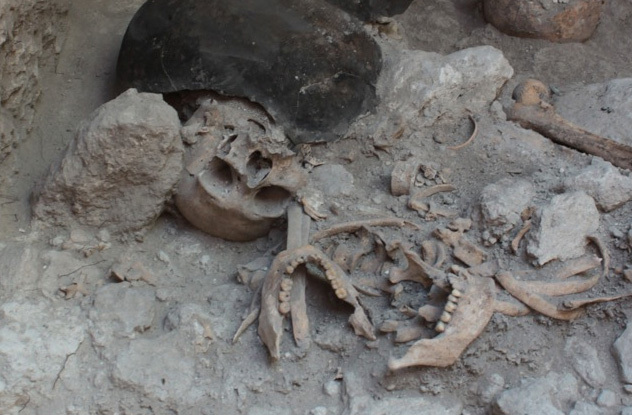 The corpses dated from the seventh century, sparking two possible theories. They were either prisoners of war who were brutally executed or they were nobility overthrown. There is evidence to the latter theory because many of the corpses had jade in their teeth, a sign of being in the upper class. 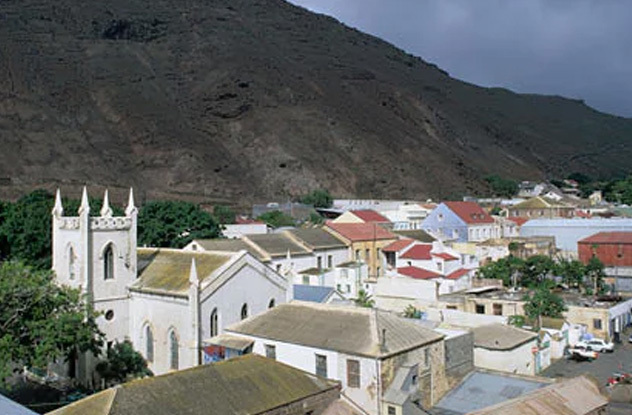 St. Helena is an island located in the South Atlantic between Africa and South America. At one time, it served as an outpost for slave traders. Any slaves who died during the crossing to the Americas were buried on St. Helena, and in 2012, their bodies were uncovered. In the 1800s, when Great Britain was trying to cease slave trading in their Caribbean colonies, the Royal Navy would take many of the slaves arriving at St. Helena and put them in colonies. Unfortunately, this wasn’t enough and the slaves who died afterward were burned in mass graves. Around 325 of an estimated 5,000 bodies were found in the graves during the construction of a new airport being built on the island. 83 percent were young people and children. 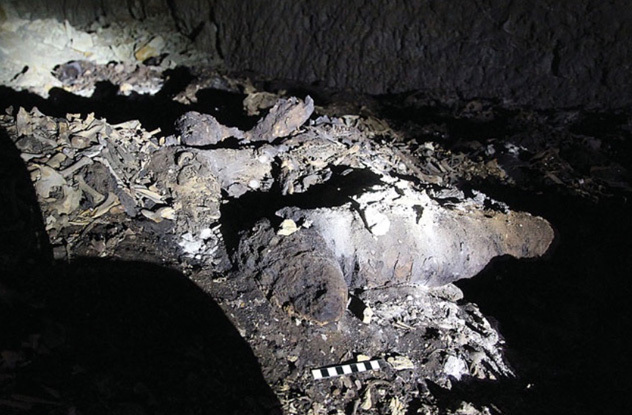 In 2015, the charred remains of 97 people were discovered in a 5,000-year-old house located in a prehistoric village in China. The bodies had been stuffed inside of the tiny house—-it was smaller than most modern-day squash courts —then the house was burned to the ground. Anthropologists studying the site believe that some kind of prehistoric disaster like an epidemic had occurred. A quick-killing disease could have caused the deaths because it appeared that they died suddenly and were obviously buried with very little reverence. However, all of this happened before Hamin Mangha—the modern-day name for the village—began keeping records, so we can only guess about the real reason for the tragic find. 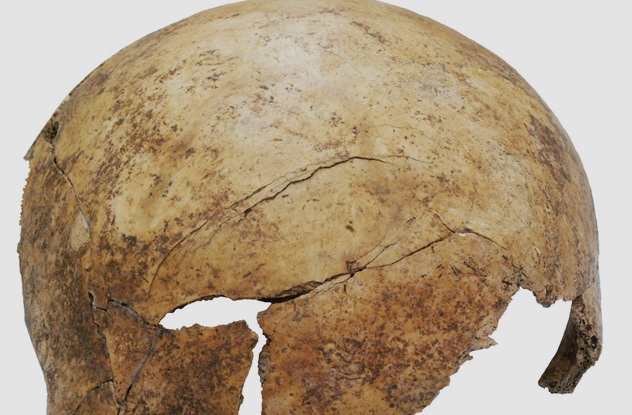 In 2006, road construction in central Germany unearthed 26 brutally killed humans dating from the Neolithic era. All of them had bones broken and their skulls smashed in. There was even evidence that they had been either tortured before death or mutilated afterward. Two other equally disturbing sites had been found—one also in Germany and another in Austria. The discovery in Germany was an apparent “death pit” containing 34 bodies, while the Austrian discovery contained 64 bodies. All of these findings illustrate a violent and uncertain past. When excavations were being made for a proposed library addition at Durham University in the United Kingdom, a surprising discovery was made: two graves containing 1,700 bodies from the 17th century. The graves had not been previously recorded, so many were scratching their heads as to the origin of the tragedy. The graves come from a dark and bloody time in England’s history: the English Civil War. It is believed that the bodies belonged to Scottish soldiers taken captive after the Battle of Dunbar in 1650. They were captured by the English revolutionary Oliver Cromwell and probably died from starvation or disease and buried in mass graves then forgotten. It is also believed that some of them might have been those killed during the Battle of Dunbar because the graves of the deceased were never actually recorded. 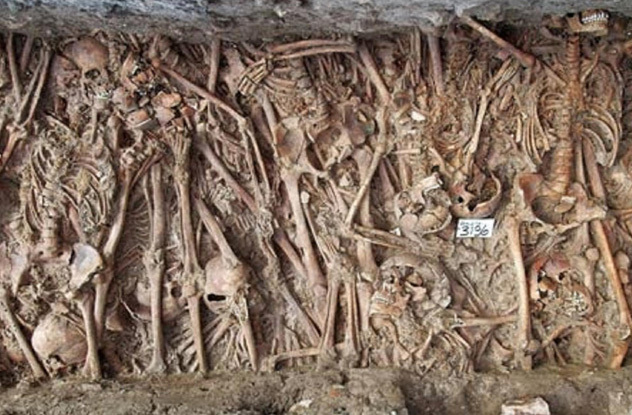 While digging the foundation for a new museum on the small island of Lazzaretto Vecchio located in the Venetian Lagoon, a grave containing 1,500 corpses were found. 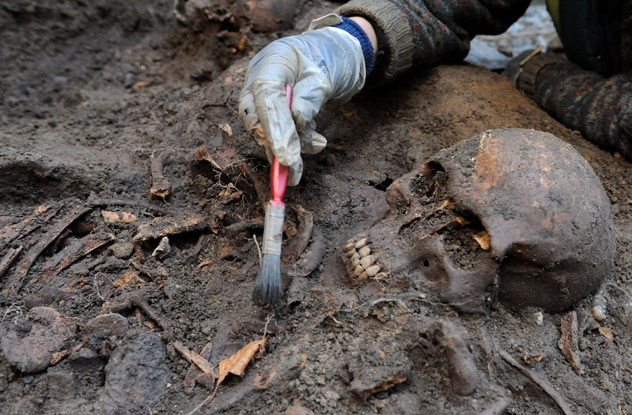 The bodies give a clear picture about one of the scariest events to sweep across Europe: the Black Plague. During the 15th and 16th century, Lazzaretto Vecchio served as Europe’s first lazaret—a quarantine colony for those infected. In 1485, in an effort to end the rapid infection of the population, officials put the infected on Lazzaretto Vecchio, called Lazaretum at the time. Since the bodies were also known to cause the plague to spread, they were buried on the island rather than transported back to the city. 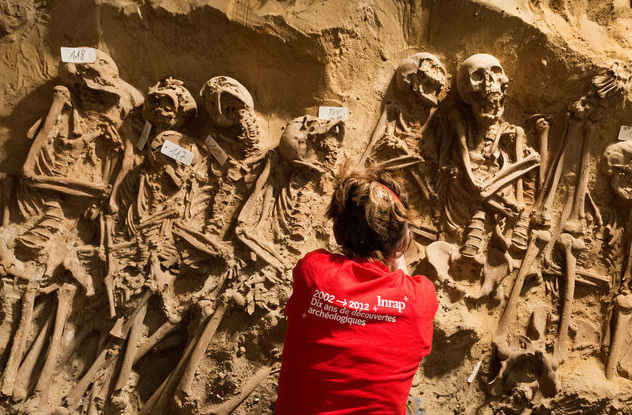 In January 2015, an expansion of the basement at a Parisian supermarket led to a grisly find: the cemetery of medieval hospital. The hospital, called Hopital de la Trinite, had been built in the 13th century and was then outside the city limits. It served in several capacities, but after the expansion of Paris over the years, the hospital was torn down and its cemetery was forgotten. The 316 buried in the cemetery could have been the victims of the plague that ravaged Paris in the 1340s, famine, or other factors, but none of them display trauma of any kind, so they weren’t the victims of war. 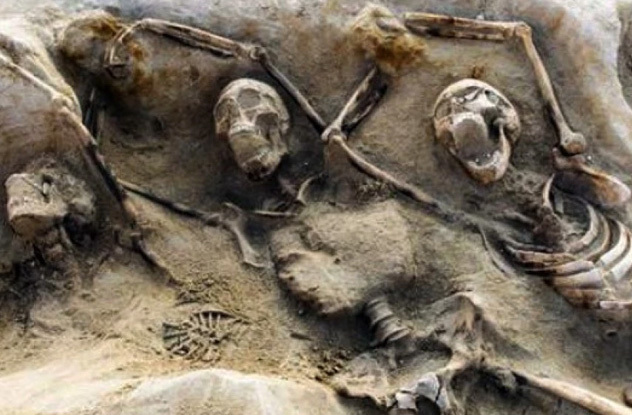 Most people buried in cemeteries similar to the one discovered were moved to the Catacombs, but these weren’t, making the find even more intriguing. The hospital itself was closed during the French Revolution then dismantled in 1812 and built over by other structures. Cylon was a Greek athlete who, thousands of years ago, tried to overthrow the Athenian government. In April 2016, what is believed to be the graves of Cylon’s followers were found. 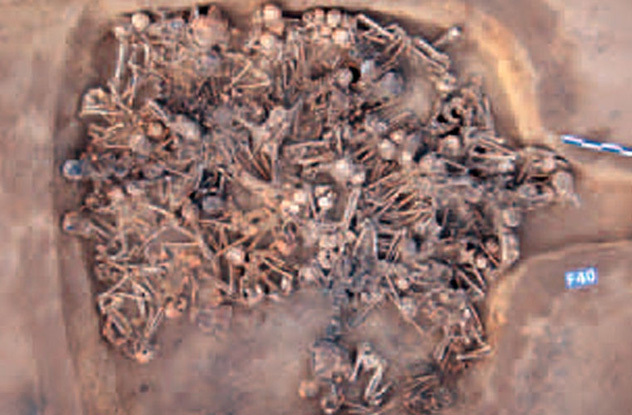 Two graves dating from 675–650 BC contained 85 men, of which 36 were buried bound and shackled. Cylon was a celebrity athlete who won the double foot race in the Olympics during the seventh century BC. Seizing upon his celebrity status, he gathered a group of his followers and tried to take the Acropolis. They were besieged there, and Cylon and his core group escaped. The remainder of his followers were left there with no food and left after being promised their lives would be spared. Instead, they were brutally killed and allegedly buried in the graves found recently. The unearthed catacombs beneath the Ancient Egyptian shrine to the canine god Anubis were found to contain millions of fossils—not of humans but of dogs. The catacombs were built as a place to leave dogs sacrificially to the Egyptian deity, and the numbers are incredible. An estimated eight million fossils are believed to be held in the catacombs. While many have long since disintegrated or were disturbed by grave robbers, the area of Saqqara near Memphis remains mostly intact. Other animals have been found, suggesting that the area held other animal shrines. But the most popular was by far the Anubis cult, and the dogs that were served up as sacrifices probably served as a major part of the ancient economy. They were bred and raised specifically for sacrificing, sold to those wanting blessings or good favors from Anubis. In Kenya, a 10,000-year-old mass grave was discovered containing the fossils of several humans who showed signs of violent trauma. 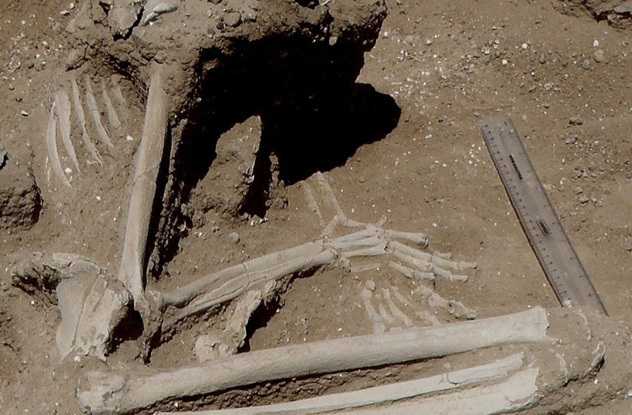 This grave is believed contains the victims of the oldest war ever discovered. The remains were found at Lake Turkana and showed signs of blunt force trauma along with arrow wounds. Some of the tools used to kill the victims were found nearby, were made of obsidian. Even females weren’t spared: One died after her hands were bound, while another was bound and killed despite being pregnant. Gordon Gora is a struggling author who is desperately trying to make it. He is working on several projects but until he finishes one, he will write for Listverse for his bread and butter. You can write him at [email protected].